Everything you need to know — in one handy resource. We’ll provide an overview of what types of cases and inquiries are aided by web investigations, what information is available online, and where to look for it. Then we’ll walk through the challenges and roadblocks you should be wary of as you launch each investigation. These range from IT restrictions on social media use to human bias and ethical obligations. 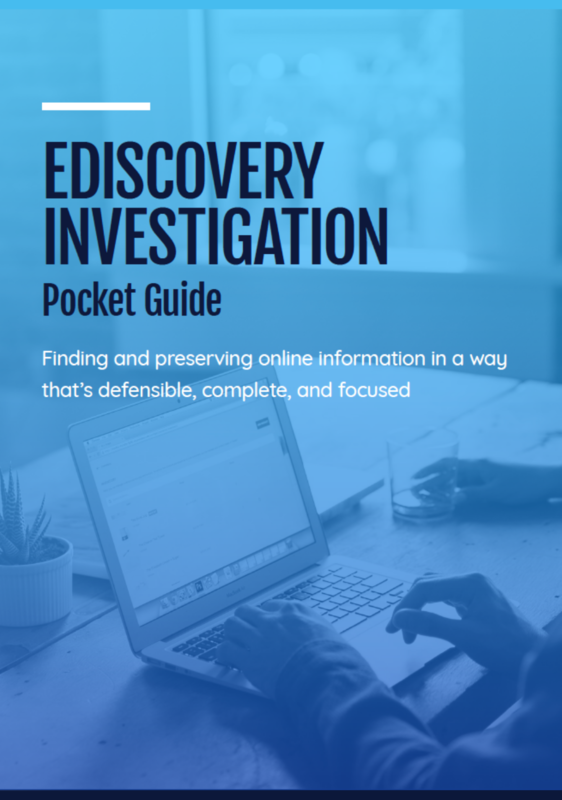 Next, we’ll explain the three key criteria every online ediscovery investigation should comport with: defensibility in both process and results, focused scope, and completeness. Finally, we’ll let you in on a better way to complete web investigations—one that checks all the boxes quickly, cost-effectively, and ethically. Everything you need to know about investigations, in a pocket-sized guide. You'll get the info you need in less than 20 minutes. The cases where web investigations may be useful are limited only by your creativity — but many still don’t know the full landscape of what they can research. You can look everywhere. But that’s not strategic. You need a consistent, repeatable process to save time and money. There are an immense amount of roadblocks in discovery, from time pressure to pre-existing biases to legal defensibility. How do you make sure each becomes a success instead of a challenge? Get everything you need quickly and thoroughly right here. You need to understand the full ecosystem of eDiscovery, but time is of the essence — especially because some of the biggest challenges around investigations come from anxiety tied to lack of time.